Just saw an email that following a four hour maintenance period on Wednesday, we'll see the new version of eservices. Anyone in the know, know what new features will be there? BTW - It seems that new features have been getting rolled out for the past few weeks. Anyone else notice the additional links, modules, and reports? Yep, reminds me, I need to get going on leveling my alts during the midsummer fire festival this week. I just had a Balance Druid ninja a Strength/Stam cloak that drops from Ahune. I'm a little miffed. I would be too, I'm not up on druids, but is that even good for bear spec? Nope, Strength does nothing for them. They rely on Agility and Stam. That's what I thought. Gotta love people like that. One of the pluses of being a mage, no one really tries to take my stuff. * - My main is a Lock**. ** - You do realize everybody else is reading this and either saying "wth?" or, alternatively, "neeeeeeeerrrrrrrrddddddddsssssss! ", don't you? As for Locks, I haven't had much issue with them, then again I simply remind locks they are hunters that wanted to be mages. Sir, dat dere 'em fightin' words. Even me, the super geek, got lost. I've played WoW once or twice but my machine stopped supporting it for some reason. Any one reading CAPTALK....is by definition a nerd......so there you go. Either warlocks are hunters that wanted to be mages, or frost mages that wanted more pets. 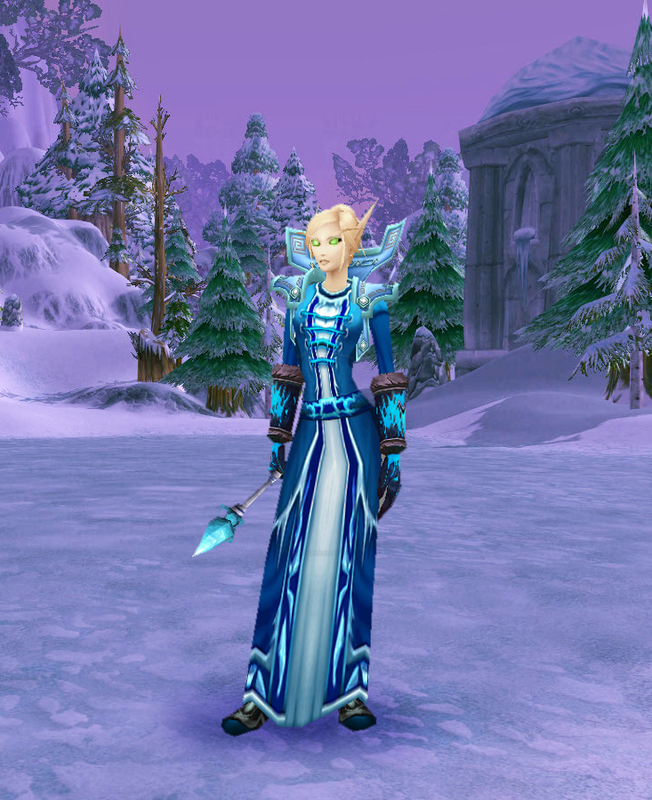 Considering mages know we're the superior class, only an insane one would make the decision that more pets than the frost elemental would be wanted/needed. Depends on their faction of course. Can NHQ give us 7 free days of CAP time to see if we want to resub or not? I would say that is suitably different at low light and at any distance, what say the masses? I think that works...assuming I rebuild my mage. Does anybody see the new E-Services yet? I get the same old version. . . Same here. I haven't found a way to swap to the new view yet. I suspect something went amiss. Thankfully that's going away with the next xpac! That staff is clearly a safety violation. I just got the option to get in to the new eServices, so it is there. They may be doing a slow roll out. I got stuck in the new eServices - anyone know how to get out of it? It logs me out when I try to go to my promotions track report. Click your name in the right corner to go back to the old version. Did it not give you all the option to view the tutorial/introduction to the new eServices when you went to it? One of the things in that video was how to get back to the old version. Please submit a help desk ticket (click the Help Desk link bottom right hand side of either version) so that NHQ/IT can resolve this issue. You have been selected to test the new eServices. Click the link below to start exploring. If you would like to go to the new eServices when you log in, check the checkbox below. If you find any issues, please let us know through the help desk with a subject of "eServices Beta". Looks OK. It's pretty much the same book, with a different cover. 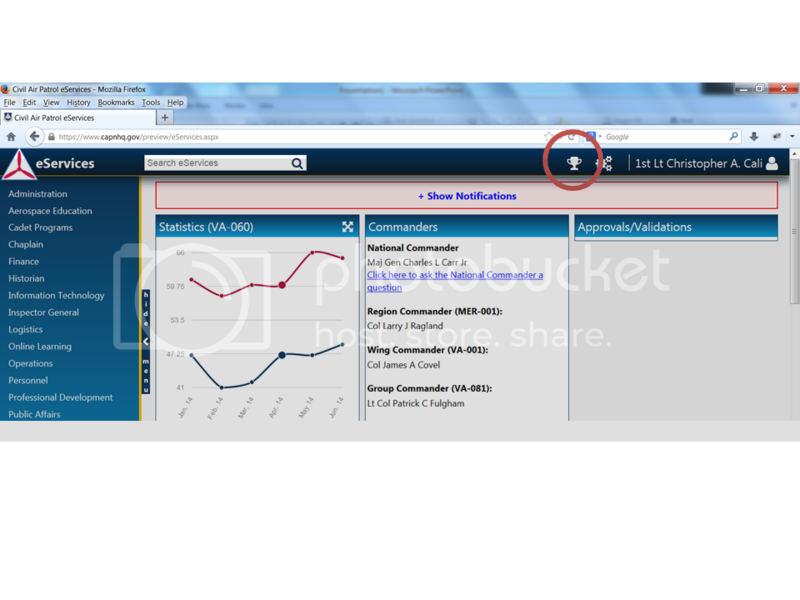 It might be easier to navigate, once the interface changeover is complete, and you can customize it at will. Seems like the "new" eServices is basically reorganization of the main page. Which is fine since most of the functionality should be familiar. It looks more like capmembers.com now. I checked the new version of eServices; my first response was "Meh. It looks okay." The squadron statistics feature is interesting, to say the least. I think I'll try it for a few days and see how I like all of it. Update: I tried looking at some stuff, like my training qualifications, and I got taken to a page with the old eServices look. Guess they haven't quite updated everything. I've been running into some broken links. It looks sort of pretty to me. Please report any broken links to the help desk, or even here and I'll pass it along. A feature you all may not have discovered about the Statistics widget is if you click on the icon at the top right of it, you can expand the timeframe and even look at different units. The facelift so far has only extended to the main page. If I recall from when I was first introduced to this, the plan is to migrate each application in time. I have (reported them to the help desk). For the statistics page, are they planning to put the members names and e-mail addresses on like the old version? Last I heard, there are plans for another widget to have the current stats (instead of the latest being the end of the previous month), likely with links to the email gathering page. I was "selected to test the new eservices", feel like I hit the lottery!!! But, not a bad start as I find my way around the new eservices. I think that screen is from when they were actually selecting people. Now everyone sees it. I'm not thrilled with it, have to re-arrange stuff. I actually don't like all the stuff hidden. Some things are not where you'd think to look at first. If you could send me a list (email or PM is fine) of what is not intuitive with the locations of certain items I'll be glad to send it forward. Where do you find you Qualifications on the new E Services? If you don't have access to the restricted OpsQuals, you can click on the trophy icon near your name at the top of the page and then click on "Qualifications". Not there, I had to go under the reports tab. You do not have the trophy icon, or the qualifications link? If you don't have the qualification link, what shows when you click the icon? I dont have the trophy Icon, or atleast this computer dosnt show it. I click on reports, operations qualifications, etc. Would you be able to send me an image of what you see on your screen for eServices? This is basically national's way of teaching cadets that things can always get worse. "We...are the CAP! We'll always save the day! And if you think we can't, we'll always find a way!" If you could qualify your comment qnd post your specific complaints, I'd be glad to pass them along. I'm trying to make some sense out of the member stats. but just looking at my own wing's 000 unit, the numbers look too low by about 30%.